This one is a bit of a show stopper and great for big family occasions! The key to success with this dish is great quality, fresh seafood. All of which should bring back great memories of a trip to the wonderful Italian Coast. With so many types of seafood in this dish, it offers a flavoursome melody of coastal flavours. Serves fantastically with a glass of white wine. Of course, you can always pick and choose which types of seafood you use and reduce quantity to make this dish for a smaller dinner affair. Boil a bit of vegetables (onion, celery, carrot, tomato, potato, sugar beet) to get the vegetable stock. Put the clams in salted water for one hour, in order to make them bleed and get cleaned from any sand that have inside. Clean the squid and cut them into small pieces along with cuttlefish. Chop finely onion and garlic and fry in plenty of olive oil. After 15 minutes add the tomatoes (previously washed and chopped) into large pieces. Cook the tomatoes approximately for 10 minutes. 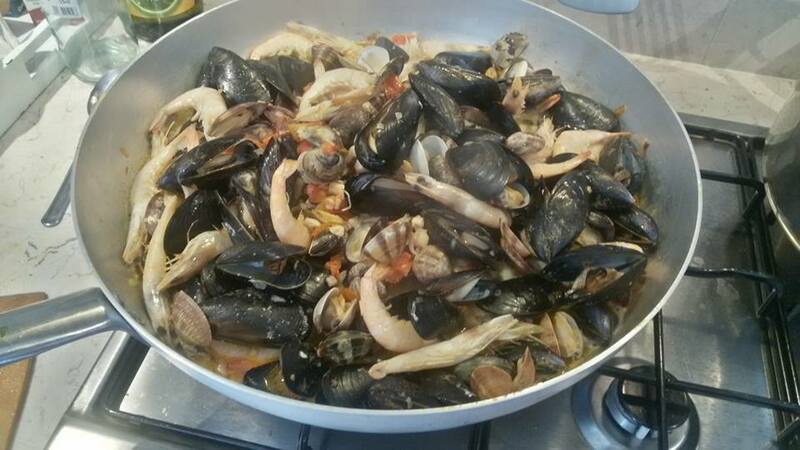 Add the clams, mussels and prawns and a glass of white wine and let it cook until the clams and mussels get opened. Put the olive oil in another pan, along with a piece of butter. Add the rice and make it toast, turning it with a wooden spoon. Add the white wine and let it evaporate and then continue adding ladles of vegetable broth from time to time until the rice is cooked but al dente. Add the rice in the marinara sauce (mussels, clams, cuttlefishes, squids, etc) and stir everything together adding more wine if the rice is too dry. Add the cheese, a tablespoon of cream, salt and pepper and serve the risotto sprinkled with chopped parsley. Is this recipe too adventurous? Learn how to make it (and more!) on our Cooking Holidays to Italy. Contact us to find out more about the holidays we offer and the regions we travel to – Amalfi, Venice, Tuscany, Puglia and Sicily.